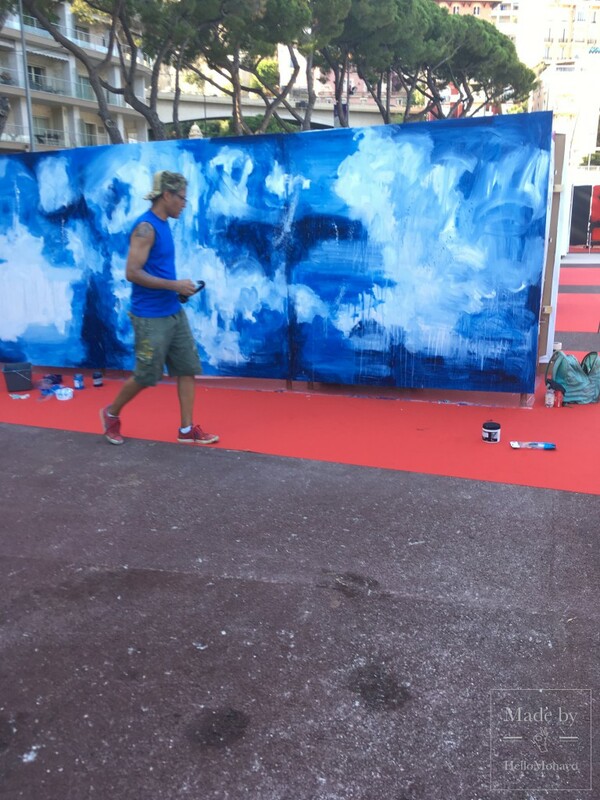 Ten Urban artists who have already created a stir in the international art-world are standing in Port Hercule in front of their huge canvasses – billboards really. 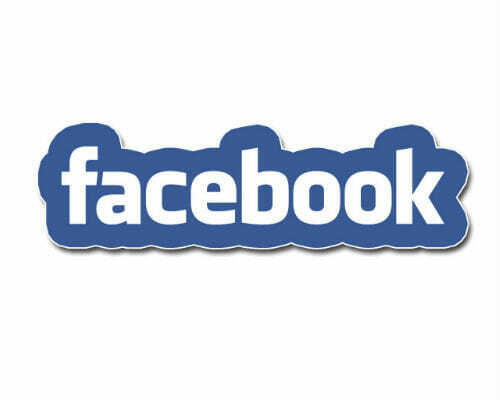 They hail from Russia, Belgium, Italy, Switzerland, USA, France, Spain, Germany and Monaco itself. It’s a wonderful event on a summer’s evening in the Principality. Over several days they created memorable art that excite us and motivate us to protect the environment. And all for a good cause. 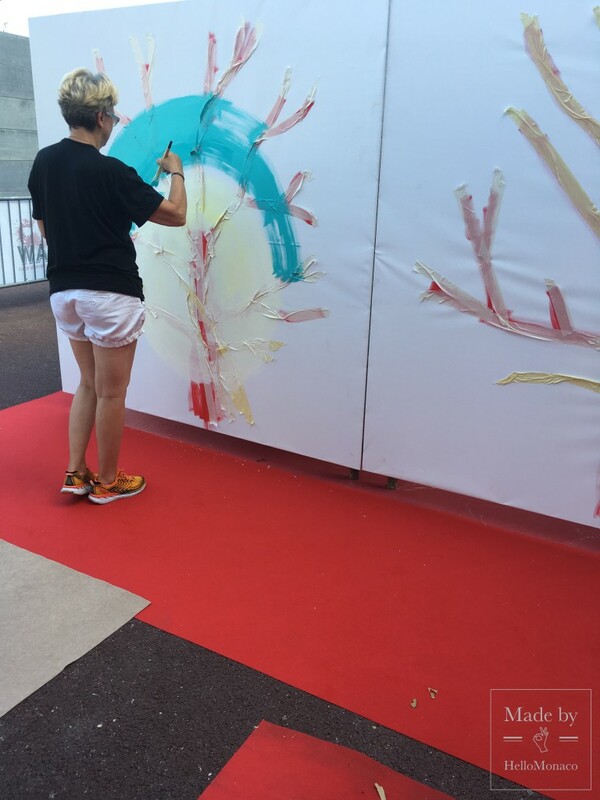 The paintings, created during the event, will be sold at an auction in Monaco. With the support of the auction house Artcurial, the Monaco town hall and the Prince Albert II of Monaco Foundation, all proceeds will be donated to charity. And for travellers and fashion enthusiasts, the manufacturer of travel bags TUMI TLX, provided each artist with one travel bag to “decorate” in an artistic way. The result was something very unusual and original, and a little easier to carry around than a billboard! If you imagine an urban artist, you might think of someone on the mean streets of a big city spending a lot of time in unsavoury surroundings – and surviving experiences with a “hard-edge”. Shatter that image – meet Beli, who was born here in Monaco. She is an urban artist with a difference. 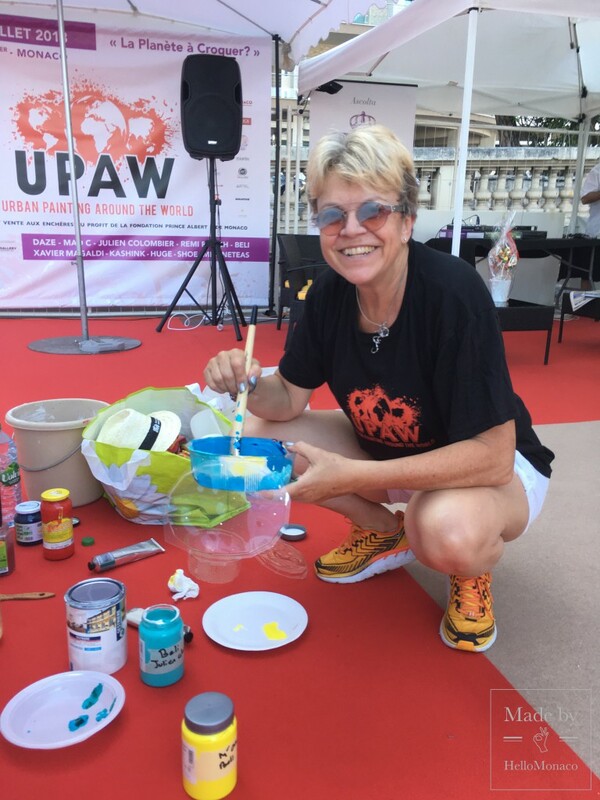 HelloMonaco had the pleasure of interviewing her at the UPAW 2018 (Urban Painting around the World) event was taking place from July 18th to July 20th. HelloMonaco: The theme for this gathering of international artists “Planete a Croquer” (Snack on a Planet) – what does it mean to you? Beli: There could be many interpretations but I like to think thatit means I can choose different things from the planet to put in my painting. HelloMonaco: Are we going to see a shark in your painting? Beli: No, it is going to feature a coral reef. And interestingly, sharks are an important part of the bio-diversity that contributes to the health of the reef environment. Kill the sharks and you trigger an imbalance impacting the population of fish the shark eat and the plants that those fish feed on. HelloMonaco: And why did you choose to paint a coral reef rather than a shark or a sea-horse, for which you are already an acclaimed artist? Beli: Because even though coral reefs only occupy O.2 per cent of the ocean floor, they affect the lives of some 500 million people or more. Art can play a role in highlighting that. HelloMonaco: In your life as an artist has there been a special moment – one that made you particularly happy? Beli: Seahorses are a passion of mine – and it was a very happy time two years ago when Cagnes Sur Mer chose one of my larger works to display near their Hippodrome – it is a large sculpture of a seahorse. 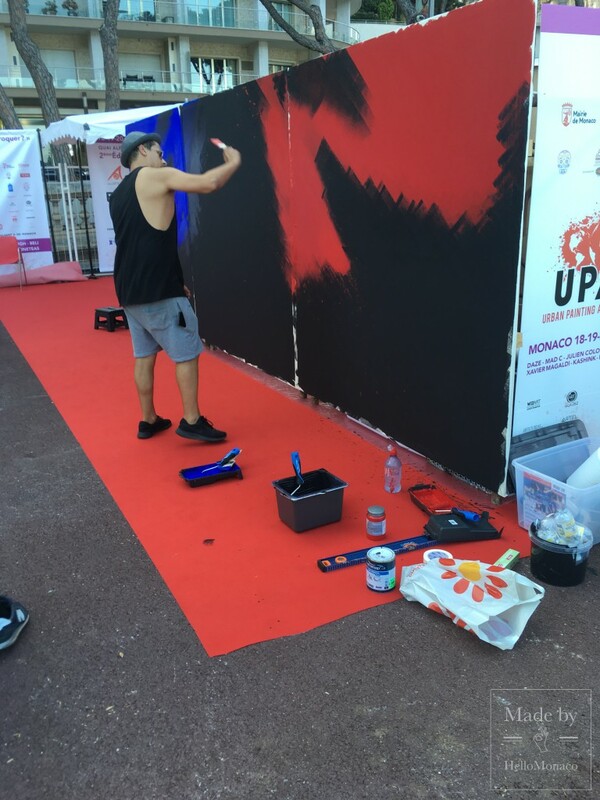 HelloMonaco: Are you here as an Urban Artist because your parents encouraged you to be a professional artist? Beli: Almost the opposite. My father was an artist himself, but only for pleasure. He told me to “get a real job”. So I studied in Geneva to be an electronics engineer – and actually qualified. HelloMonaco: And you got a job as an electronics engineer? Beli: (laughing) Yes, but it only lasted for a month (more laughing). Daze is an internationally renowned urban artist from New York. 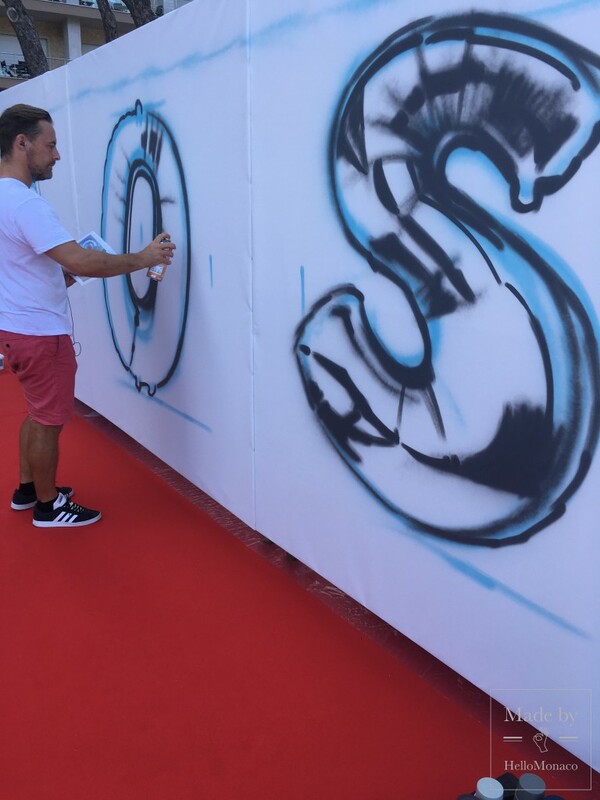 He is more typical of what we might expect of a graffiti artist. Imagine the initials of his name boldly adorning the walls of the subway in New York. HelloMonaco interviewed him as he was standing in front of his giant canvass waiting for inspiration to strike. 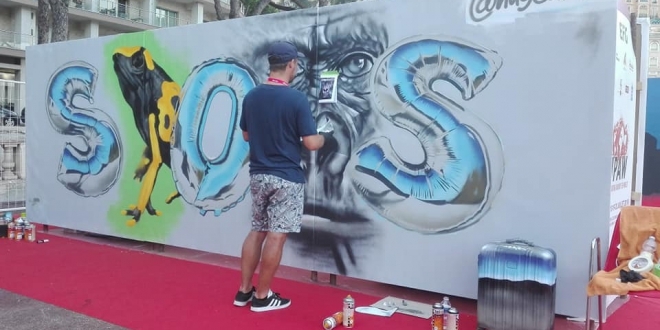 HelloMonaco: Do you sketch something beforehand to help you create this giant painting? Daze: No, I paint from inspiration. And I draw my inspiration from my surroundings. It is, above all for me, a spontaneous process. HelloMonaco: Do you have a theme in mind linked to “Planete a Croquer”? 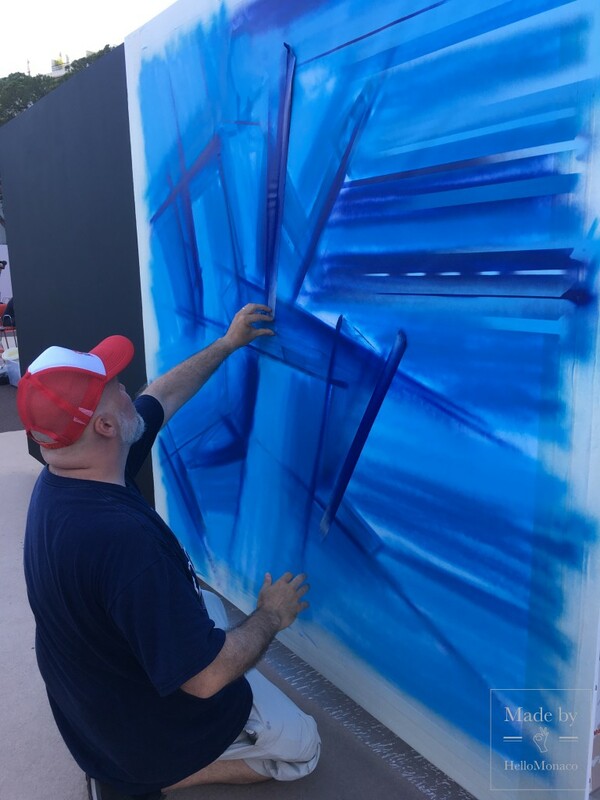 Daze: Coming from New York I am struck by the beauty of this pristine Mediterranean environment – that is what I want to capture in my painting. And the need to protect the natural beauty that you have here. 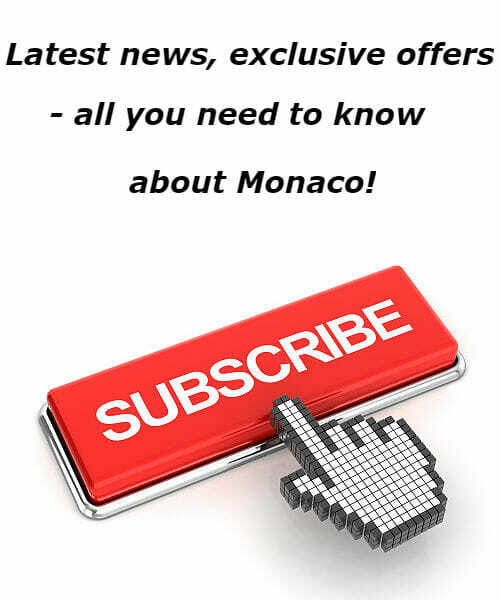 HelloMonaco: What especially about Monaco do you like? Daze: I visited the Oceanographic Museum. It sets Monaco apart,it is so unique. It is in my mind right now. The jellyfish in particular. They are an artist’s dream – their shapes and translucence. HelloMonaco: What will you take away from this visit to Monaco? Daze: Monaco has played a special role in my life. I was invited here twenty-eight years ago byGalleryB5 Speerstra. I was amazed; it was before the Internet. I had made a buzz in New York with my work, but for Speerstrato find me in New York from Monte Carlo – that was a little miracle that was a turning point in my career. 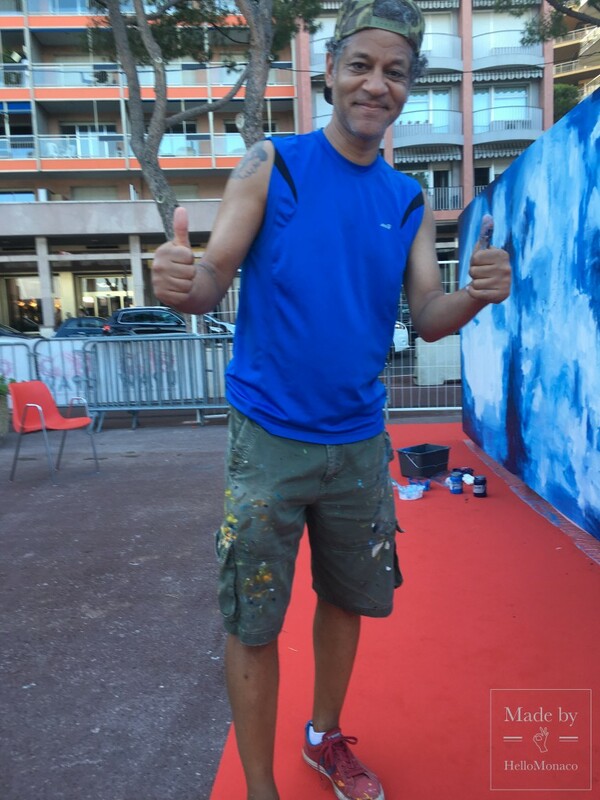 They brought me to Monte Carlo from New York to exhibit my work. 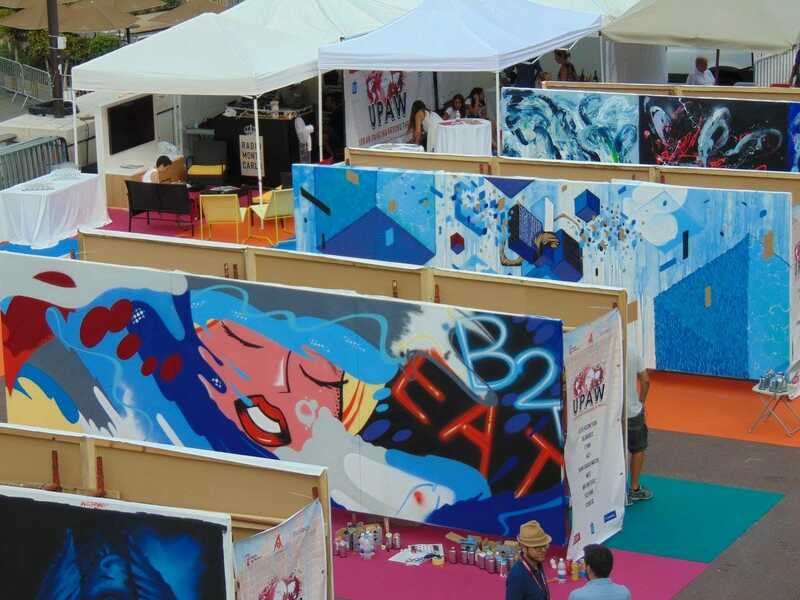 Each of the artists has a fascinating story, something special that makes them stand out on the world’s stage – that has brought them fame and led them here to Monaco. 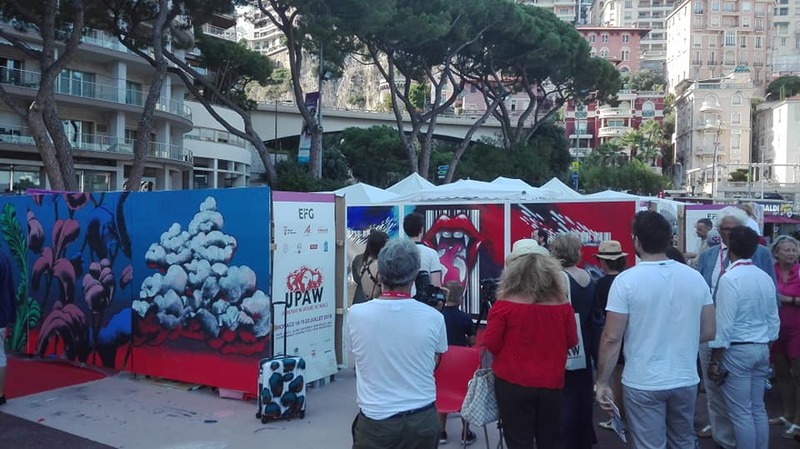 Art, entertainment, genuine concern for the environment and friendly competitive spirit – in a perfect Mediterranean setting. It was interesting to watch it all appear on canvass before your very eyes.